Armstrong's rendering of the Shanley Building is taken from a somewhat unusual point of view. The geometry of the construction puts the viewer just below the top of the wall. 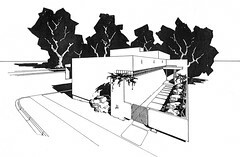 This is evident by the alignment of the horizon line (at the left and right sides of the background trees) and the three ventilation grilles located above the long horizontal strip of glass blocks leading from the planter on Maryland Avenue back to the cantilevered canopy over the inside corner entrance. The position of the viewer horizontally is also far from coincidental as it aligns with the face of the floating garden wall. This view allow Armstrong to reveal both sides of this long narrow space leading from the sidewalk directly southward toward the entry. On your left as you enter the garden gate is a largely blank white stucco wall relieved by a long horizontal strip of glass blocks set flush with its surface. This line of glass gives the wall a sense of dematerialization by denying any visual suggestion of structural support for the portion of the wall above. The three ventilation grilles punctuate this wall with a rhythm echoing the visual structural supports creating the illusion of a floating garden wall. The vents allow for fresh air between the interior ceiling and the shallowly sloped roof (hidden behind the flat parapet).